It's my birthday today, which means it's exactly one year since I got my sewing machine and was bitten by the sewing bug. I'm really loving being able to create beautiful things for my family and friends, especially my kids, and can't ever see myself getting tired of sewing. This week also marks my last week of maternity leave, as I return to work next Monday. I have mixed feelings about this, as it means putting my youngest in childcare for two days a week. He's only 10 months old and we've never been apart, so it's going to be a huge change for us. 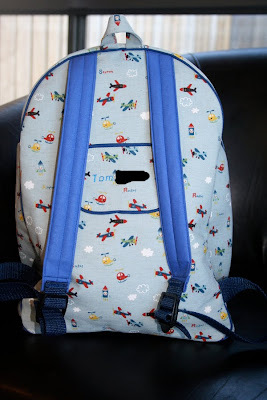 I decided to make him a backpack to take to daycare so he's got something special 'just for him' that was made by his mummy. I know he won't have any clue about that, but it will at least make me feel better! 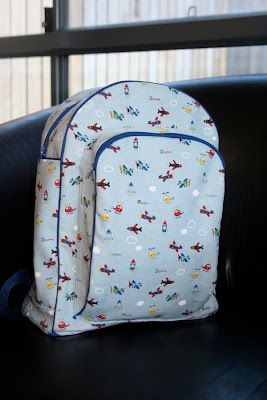 I used the toddler backpack pattern by Made by Rae with a few amendments: I added a zippered pocket to the front, increased the height by 2 inches and fully lined it. I also added a nameplate to the back. 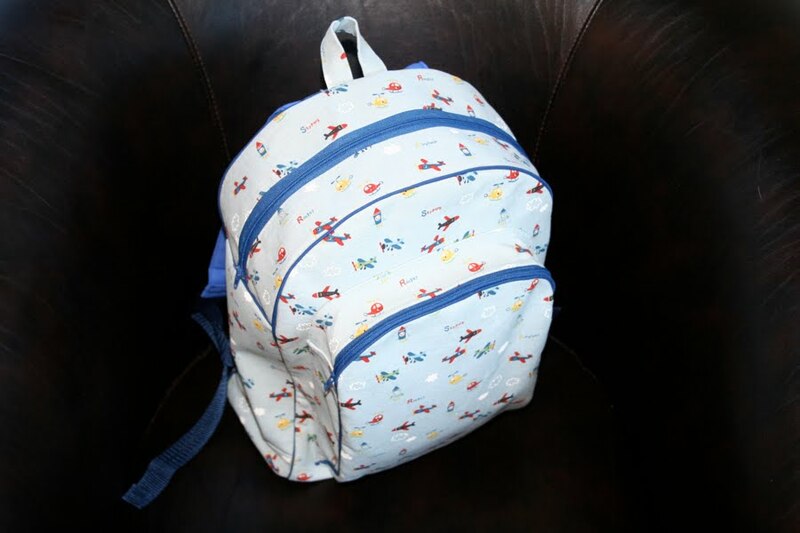 The backpack came together without any fuss and I had fun picking the fabric (cute Kokka aeroplanes) and trims. This was my first time using a zipper and I was pleasantly surprised to see how easy it was. It was also my first time working with piping (ready-made) - I liked the effect and am looking forward to using it again. View from the front. I drafted my own patten for the front pocket and am pleased with the result. Side view. 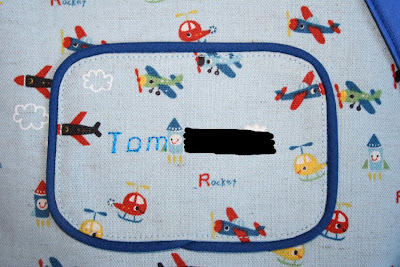 Even though I used cotton canvas and interfaced it, it's not quite as firm as I would like. Back view. The straps are padded at the top. The bottom section is webbing and adjustable. The nameplate. I machine-embroidered Tom's name and trimmed it with piping. I added lining to give the bag a neater finish. All seams are bound with contrast bias binding. 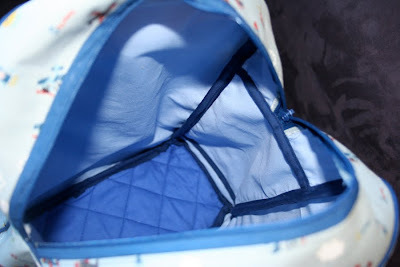 You can see the quilted bottom here - it's the same on the bag's exterior too. And the top view - my two very first attempts at a zipper! well done! looks awesome! How great is Kokka. Oh really great. I like the pocket too. I found mine is a bit saggy too even with interfacing. I think if I used two layers of Vilene it would hold up better but I don't mind as I hang the bag up anyway. I love your choice of fabric and oh the patience you had with the binding inside. Excellent job. Gorgeous job - I love the fabric choice. I'm hopeless at doing things on the fly - like lining this - what a great idea - I don't like the exposed seams inside the ones I made. I used Shapwell and it was good as far as making the bag sturdy. This is really great! I love this pattern, but haven't tried it yet. Being a working mommy is hard. I hate leaving my girl every day, but alas, we do what we must! Good luck with it. You've seriously only been sewing for 18 months now? You must have a natural talent, your pieces are really beautifully sewn. saw your pretty bag (on Flickr and came to your blog) and i wanted to ask if you used any kind of interfacing or a heavy-enough fabric. Hey, just popped over from flickr. This is such a neat version. That little front pocket is so practical, and the lining too. Nice job! Hi! Just out of curiosity, did you by chance keep the dimensions of the pieces for the zipper part that you added onto the front of the backpack? 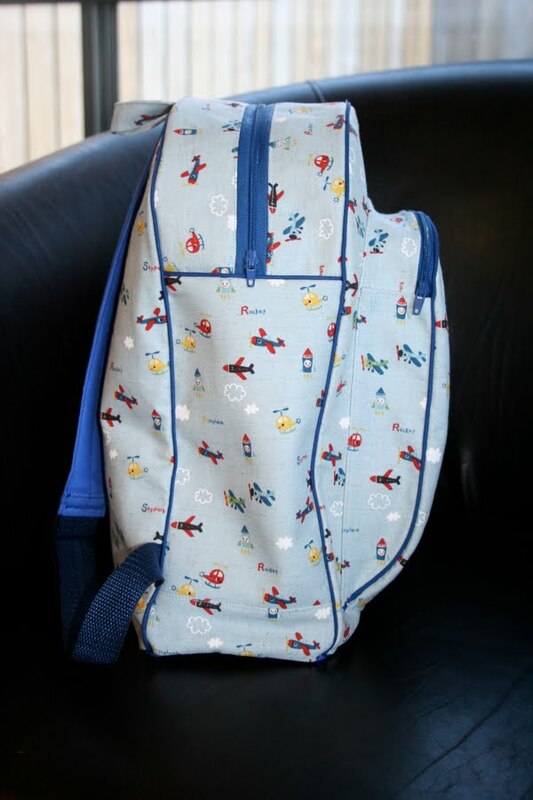 I make one of Rae's backpacks already and would love to add that zipper pocket on to my son's that I'm making now. Thanks! !